If you understand that investment earnings and investment withdrawals have nothing to do with each other, you will understand more about money than 95% of the people around you. First, let’s take a minute to make sure that you and I are on the same page. Investment earnings are what your investment earns. 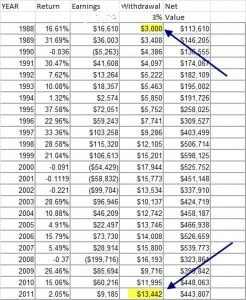 So if you put your $10,000 in the bank and you earn 1%, your investment earnings are $100. Simple. Withdrawal rates are what you take out of your account and spend. In the example above, you might earn that $100 but take nothing out. In that case, your earnings are 1% and your withdrawal rate is ZERO. On the other hand, you might take $5000 out of the account (a 50% withdrawal rate) and earn only 1%. You can see that you can do this only twice before you are broke. When is this issue crucial to your financial security? While most people understand this concept when they think about the very short-term, they completely ignore the idea when they do long-range retirement income planning. Let me explain. When people retire, they usually believe it’s super important to withdraw no more than they earn on their investments. This makes sense at first glance. If you take out more than you earn over a long enough period, you’ll go through all your money. Then, you’ll have to spend your retirement working behind the counter at Flippy Burger. Not a good tone. But if you expand on that theme, you’ll see the problem. If you put your money in the bank, you’ll earn maybe 1% which isn’t enough to live on for most of us. If you invest in bonds, you might earn up to 5%. That is very attractive now but it will be a problem down the road. If you understand how bonds work, you understand that the interest you receive never changes (unless the bond issuer goes bankrupt). While that 5% looks juicy right now, it won’t be enough income for you 10 or 20 years down the road. That is especially true if inflation heats up. The alternative is to use equity investments to create portfolio income. I think this is a fantastic idea. But the problem is you can’t predict what you are going to earn in any particular year using equity mutual funds or stocks. It’s completely unknown. That means if you use equity for your long-term investments (which is a good idea) you can’t possibly tie your earnings to your withdrawals. Conversely, if you insist on tying your withdrawals to your earnings, you will have to ignore equities as an investment idea. That is unfortunate because it’s one of the best ways to invest for long-term income. How do you reconcile this conflict? It’s easy. Expand your mind. You simply have to shift your thinking just a little. Yes your withdrawals must be equal to or less than what you earn on your money over the long-run but not over the short-run. Certainly this equation doesn’t have to be true every year. Let’s look at an example to clarify this. I met with a couple yesterday who are very conservative so they invest using a very balanced approach. Terri retired 5 years ago so her income is fixed. Jim is going to retire in a month or two. He’ll have pension and social security income that will make up for most of his income. But the couple will still be about $15,000 short on an annual basis. Jim has about $500,000 in his retirement account. If he withdraws 3% of his current balance, he’ll have that $15,000 he’s missing. When I suggested this idea, Jim got a little queasy. He pointed out that he didn’t earn 3% on his money last year. He pointed to a number of concerns he had about the economy and seemed worried. But when we looked at the facts, Jim and Terry seemed to have a change of heart. What where those facts? Yes, his investments failed to earn 3% last year, but they had earned much more than that already this year and we were still in the first quarter of the year. Moreover, when we looked at the historical performance of his account, we saw that while there were years that yielded negative results, there were far more years that yielded positive numbers. 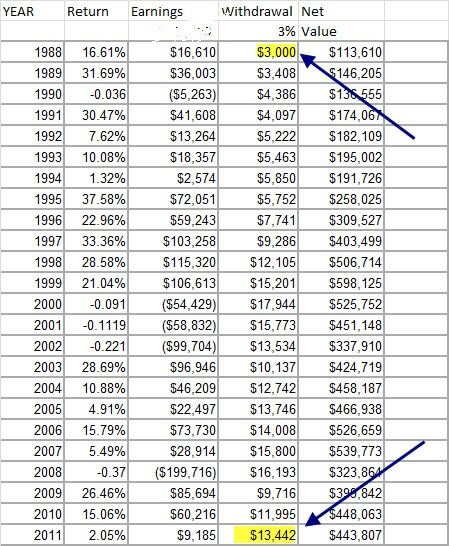 If you could invest $100,000 in the S&P 500 there would still be no way to guarantee you could earn that 3% every single year. But you can see that over many years, you earned a heck of a lot more than 3%. In fact, because you used growth to create income, you actually created 4 times as much income. That’s because over many years, your capital grew by a factor of 4. There is no way a bank or bond will do that for you over the next several decades and that is the key. At the same time, I have to state that there is also no way to guarantee that the stock market will provide these kinds of results either. They are historical only. But you can see how this approach has merit. You have to make sure your investments match your time horizon. Your long-term needs should be met with long-term investments. Then select a withdrawal rate that is less than your average long-term results. Don’t worry about matching your returns and withdrawals on an annual basis. How are you investing for retirement? Do you fret over returns and withdrawal rates on an annual basis? Good article, has helped me consider the bigger picture when counting on withdrawing gains from investments.